Yay – rhymes with and is a synonym of hooray. It’s used in cases of excitement. 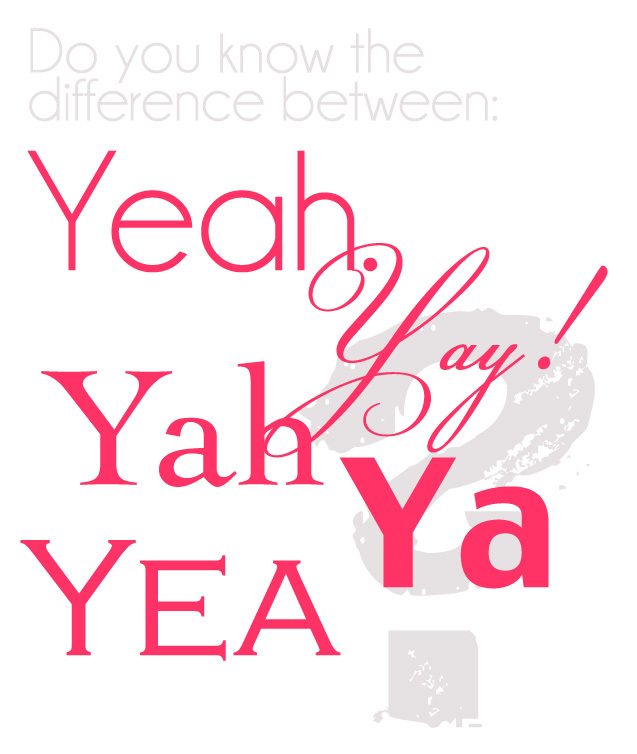 Yah – is also an expression of agreement but there is no excitement. If you need more edumacation (yes, that was a joke) on the subject I suggest Grammar Girl’s Quick and Dirty Tips for Better Writing (Quick & Dirty Tips) she also has a Podcast. I Googled this and your site came up… I’m ALWAYS getting these wrong. So now I’m bookmarking this page for the next time I get confused. Thank you I have a friend who constantly claims that yea- is the same as yay. and we always use it as an abbreviation for yeah. http://www.time.com/time/magazine/article/0,9171,951355,00.html This Time article says it’s “Yeah or Nay”, not yea. I hate when I see people use “yeah” when they really mean “yay”. Like, “I’m going to the beach today! Yeah!”! Why dont they understand that is just wrong…it doesnt even sound right! I am no grammer or spelling expert, but that seems so obvious to me. Yeah, this is a good explanation. Yay, I'm glad I found this site! Thanks, GENPINK, for clarifying these as I, too, have seen variations and had become totally confused as to which one is correct usage. I believe your grammer is correctly spelled, grammar. Sorry, just had to mention it. My husband is a fanatic on correct spelling and pronounciation, particularly…congratulations vs.
congradulations. One hears so many people incorrectly spell and pronounce that word. I would not consider you to be an expert on grammar either. Yeah, this is a good explanation. i was glad to learn the way to spell yay, i was spelling yah, opposite of hay!! now i know, thank you.